On this blog, we will follow all the shows that take place tonight. Preselection action from no less than 7 countries! Please keep refreshing this page! That way, the latest comments will appear on top. Italy’s final is the only show still going. So please, click HERE switch to Sadie Trent’s liveblog about San Remo 2019. This blog is finished for tonight. Thanks for following us and we hope to see you again next week! We are very close to the results in Montenegro. “But first they’re doing some lottery thing for a televoter to win a free holiday,” says ESCDaily’s correspondent Brandon McCann. Get on with it! The big names have been on stage now: both Nek (who gave our correspondent Sadie Trent “Robbie Williams vibes”) and popera group Il Volo, who brought Italy a 3rd place in Eurovision 2015. Will they go to ESC again? Monika Marija is through to the next round. The same goes for Henry & Tommy Modric, Justina Budaitė-Junà and Jurgis Brūzga. Francesco Renga just sang a song in San Remo that our correspondent Sadie Trent labeled “a dated gangsta entry”. Her song “Light on” gets the maximum points from the jury. Televote scores still to come. The Italian final of San Remo is famous for its long duration. We are now two hours in, with no signs of speeding up. We have exciting finals running in Italy and Montenegro, both countries select their Eurovision act tonight! Lithuania is also still going. Results from Iceland, Hungary, Ukraine and Sweden’s Melodifestivalen are already out and can be found on the ESCDaily homepage! And we’ve heard the last song in Lithuania. Cheri had the honor to close the evening with her song “Again”, which was a very unspectacular end, according to our correspondent Robin Tas. Waiting for results now! The Montevizija final looks prerecorded, says Brandon McCann, who follows the show for ESCDaily. “All the artists just recorded a video from their own homes.” Meanwhile, Montenegro uses an international jury which features Ruslana and Ira Losco. With her song “Eitt andartak”, she qualifies for the final of Söngvakeppnin. “And there is Monika Marija with her ballad song “Light On”. It’s a pretty good song, she has solid vocals. She is on stage with backings and some sort of mirrors. The audience and jury seem enthusiastic,” says Robin Tas, Baltic expert for ESCDaily. Local time in Kiev is around 1AM… But now we know that MARUV and Brunettes Shoot Blondes and YUKO are through to the final of Vidbir. Arguably one of the biggest names in tonight’s San Remo final in Italy. However, earlier in the week, the jury put Nek in the lower group… Can he recover tonight? The Hungarian televoters have given The Middletonz (with András Kállay-Saunders) the 4th and last ticket to the A Dal final. 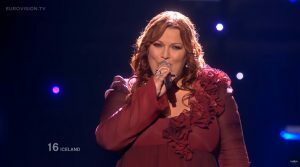 Big shock in Sweden: Hanna & Liamoo take the second ticket to the final, while Polish superstar Margaret is eliminated! Anna Tatangelo just performed. “I think she maybe a surprise later on in the night,” says Sadie Trent, who follows the San Remo final for ESCDaily. Tatangelo won San Remo twice, but always in subordinate categories. 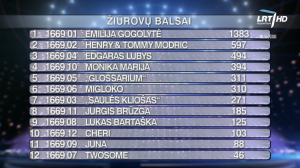 Meanwhile in Lithuania Emilija Gogolyté is still in a strong position (based on preliminary televotes) with her jazzy song. She is followed by Henry & Tommy Modric, who have only 650 votes. Not Andreas Johnson or Margaret, but Malou Prytz is the first qualifier in Melodifestivalen tonight. With his song “I do me” he is through to the final. Televoters can still save Kállay-Saunders (or someone else) in the extra voting round. The first two knocked out in Melodifestivalen tonight are Oscar Ernestad and Jan Malmsjö. The other 5 go into the second voting round, including Margaret and Andreas Johnson. 21:02 – And in Montenegro! …our correspondent Robin Tas is wondering how Edgaras Lubys made it this far. “From the first note in his performance, he is already off-key.” Monika Marija comes on stage later tonight. 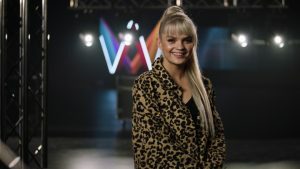 Hera Björk, fan favorite in Eurovision 2010, will try to represent Iceland again. Her journey in Söngvakeppnin starts tonight! Melodifestivalen rushes through the performances. We are already at the last song: Margaret with “Tempo”. Just the other minute, Liamoo (6th last year) was on stage together with Hanna. “Her voice is great and I felt LIAMOO was holding her back instead of holding her,” concludes Allie Lindo. We are 40 minutes in, and have only really seen two performances. Robin Tas follows the show closely for ESCDaily, and more updates can be expected soon. In the first round, Petruska and Acoustic Planet were popular with the Hungarian jury only. But tonight, they manage to get a good app vote too and score even higher than in round 1. “Jan Malmsjö surprised us with a haircut and shave. He looks totally different,” says Sweden expert Allie Lindo about the Melodifestivalen runner-up of 1969. Two big names in the Italian preselection this year: Nek and Il Volo (ESC2015), but both were struggling earlier this week. What can we expect from San Remo 2019 in tonight’s final? It starts in a few minutes! Allie Lindo is not really excited about Andreas Johnson’s performance in Melodifestivalen, Sweden. The band of lead singer Ádám Szabó scores a low 34 jury points in tonight’s A Dal semi final. 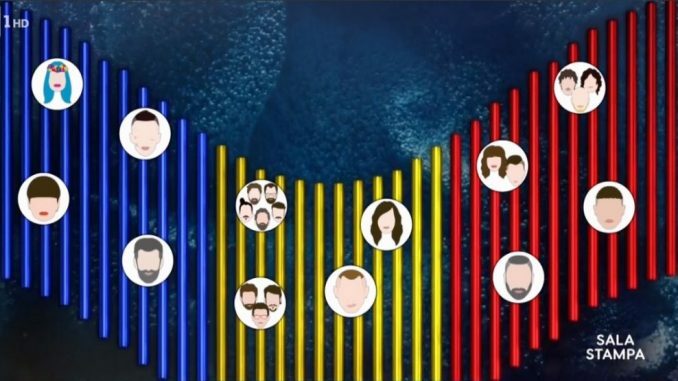 During the first round, yesyes only qualified through televoting. Polish superstar Margaret tried her luck in Sweden’s preselection last year, and reached a respectable 7th place in the final. This year she tries again and tonight she is up against i.a. Andreas Johnson and Liamoo, who was a finalist last year and finished 6th. Vidbir always starts early due to Ukraines Eastern timezone. The performances are over, and now they take their usual one hour (!) break, while we wait for results. Tayanna was supposed to perform in Vidbir tonight, but she withdrew last minute. Maruv performed in her place. The man who brought Hungary a 5th place in Copenhagen in 2014, is going for his 5th A Dal final tonight. He is up against Petruska and newcoming band Acoustic Planet, who both achieved great scores in the first round. A Dal is, together with Vidbir in Ukraine, the only show that has already started.